Adham Shaikh has over the years had the pleasure to work with many talented musicians on stage and in the studio. Recording a wide variety of world instrumentation, he has woven the sounds of India, Bali, Australia, Africa, Jamaica, the Middle East, Slovakia, Scandinavia, Turkey and North America into all aspects of his production. The Dreamtree Project is the Indian dub fusion project of ethno electronic master Adham Shaikh and Sitar virtuoso Uwe Neumann, featuring tablas,dhol,and electronic percussion by Gurpreet Chana and special guests Marty Carter and Ben Johnson. 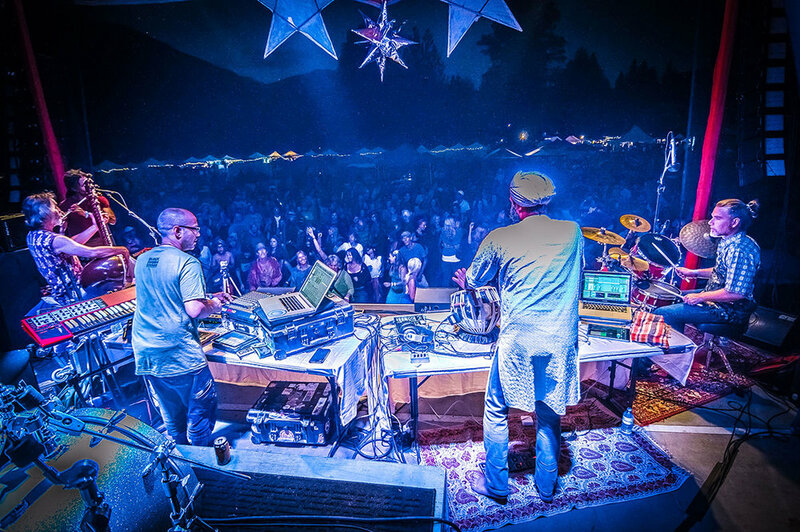 This dynamic trio weaves a magic carpet ride of Classical Indian raga afloat a dub cloud of swirling tabla, mystical flutes, spacey beats and booming basslines. Beyond notions of East meets West, Dreamtree creates a powerful audio and visual environment for dancers and listeners alike. including a unique performance at the Millennium-Concert for H.H. the Dalai Lama in Benares, at the Alliance Francaise in Pondicherry, at the Sri Aurobindo Institute of Culture with tabla virtuoso Subhen Chatterjee and the prestigious hall Rabindra-Sadan in Calcutta. [Director: Richie Mehta, Music Composer: Dr. Shiva] and “Bhopal: The Search for Justice” [Director: Peter Raymont & Lindalee Tracey, Composer: John Welsman].